Like many young artists I know, my life drawing doesn't have much bearing on my ability to draw figures in comics. I went to art school, SVA to be specific, and while I was there I not only took classes but also drew the figure from life in my spare time rather a lot. I went to free sessions in one of the droms, sometimes audited classes, and drew people I saw out and about. And though I'm no Rembrandt, I was notably good at it. I know how to observe something and put what I see to paper. But I never learned anything from life drawing, and when I'd draw comics I'd find that being able to see what I wanted to draw was a crutch, and without it I wasn't very good at all. I've always been a little baffled my the disconnect from my ability to observe the figure and my inability to generate it from whole cloth in my head. Of course, as I said last week, I recently had an epiphany about this. I realized that the way I'd been taught anatomy was rather like someone saying to you "Here's how to draw the earth in great detail: First, draw a circle. Now, look at the earth until you can draw all the stuff inside the circle from memory." I reject this method as old and busted, and have proposed my own New and Hot method. My goal here is not to teach absolutely correct anatomy. I'm not even qualified to do so- I can't tell you from memory how many ribs you have, and I often have to look real quick to remind myself of exactly where many leg and arm muscles insert. But most cartoonists don't need totally correct anatomical knowledge. Most people I know struggling through their figure drawing, myself included, just want a guide to getting the basics right every once and awhile when we're drawing someone muscular or drawing an unusual pose, and we have deadlines and we're ignorant and we can't afford the time to go and do hours and hours of research just to learn how to draw one pose in one panel in a comic we're drawing. We have jobs, we have schedules, and we need fast mental tools to help us make our art better and faster. Furthermore, as cartoonists, we often draw figures that don't quite match correct human anatomy. But that doesn't mean we wouldn't like to be able to connect everything up correctly, if for no other reason than it looks better and makes us have to re-draw a pose less to make it look right. 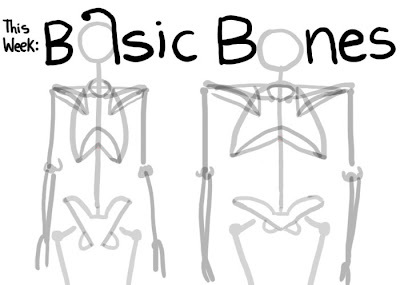 The anatomy lessons I'm giving here are not totally correct, but they're scalable, easy to remember, and produce results that will allow you to draw and reposition bone and muscle easily. Quick and dirty, just what the cartoonist needs. If you don't remember how we got here, please go back and re-read the entry before going on. These lessons are cumulative. You'll notice that on the right I have a figure that is clearly out of proportion. I'm using it to illustrate my point that these mental tools will work for any character of any degree of distortion- you don't need to be drawing photo-realistically to be using this to understand your character's internal structure better. So, we have our basic shapes, a ball indicating the round mass of the top of the skull, a rounded cone for the ribcage, a hoop pulled out so it touches the front and back of the cone and whose ends extend beyond the sides, and a pelvic bowl. We'll draw the pelvis first. 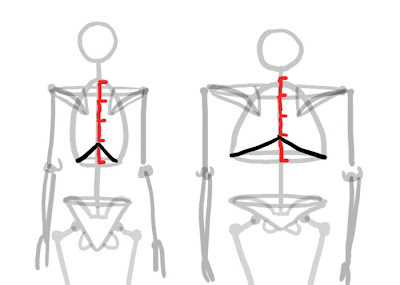 In the last lesson I said the pelvic bown should always be a little wider than the widest part of the ribcage. It is true that in some men, especially men with wide torsos and narrow hips, the measurement is actually a tad narrower. And in many men it's equal to the width of the ribs. In woman, they're rather noticably wider. But everyone's hips are different. You should play around and see what works best for your characters. But generally, the pelvis should be slightly wider than the ribs. Start by drawing a notch about a third of the way down the pelvic bowl, representing where the spine would meet the sacrum, or the spiny-looking part of the pelvis that the tail bone comes off of. Now draw two arches from the sides of that notch to the sides of that bowl. 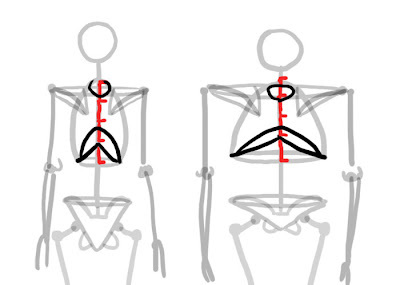 You've just drawn the iliac crests, which form the ridges of your waist. Draw two small little loops below the hip dots, having them come down as low as the bottom of the bowl. You've just drawn the ischums, which in addition to making the pelvis look instantly pelvis-like, are also the key to drawing the muscles later on. 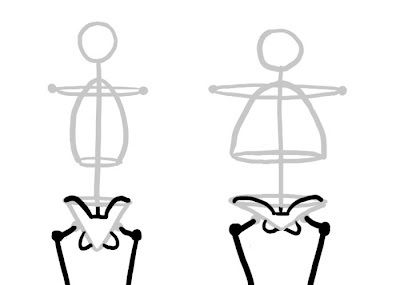 Now draw the dots for the greater trochanters- the bendy part of your femur that you probably think of as your hip joint, even though your hip joint is far deeper. Draw the dots lower than the sockets but not lower than the little loops. Connect them to the sockets with a line, and draw a line that slants inward for the femur. Nw on to the shoulder blades. Shoulder blades seem soooo daunting, but they're not at all. They follow very simple rules about where they're placed. All you need to do is find where the bottom point should go when they're at rest. Draw two dots just slightly above halfway up the ribcage. 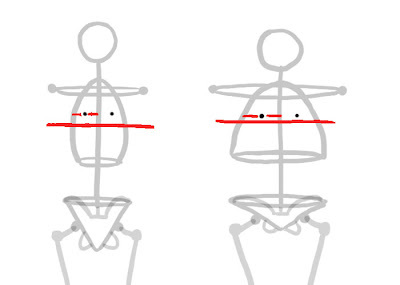 The dots should be half way between the spine and the edge of the ribcage wherever you place them. At this stage you can also go ahead and mark off where your elbows will go- remember, at rest, they should always come between the ribcage and the pelvis. Now you have your arms! The shoulder blades move as your arms move, but the tops of the blades stay stuck on the hoop. 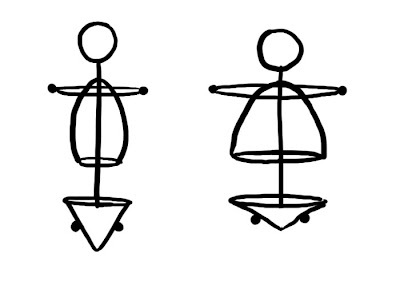 If you lift your arms way up, the hoop bends and the bottoms of the blades stick out sideways, but the tops are still on the hoop, as are the collar bones. The collar bones and the tops of the shoulders are like a yolk that sits atop the rib cage. It may bend, but it keeps it's essential structure. The hoop can never come unstuck from the front and back of the ribs, and neither can the centers of the shoulder blades or collar bones. 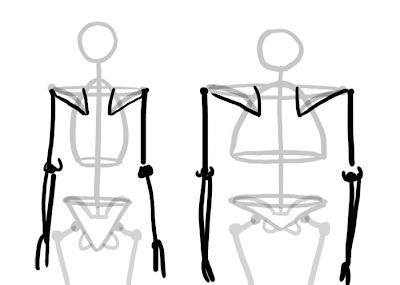 Now let's draw the ribcage. Measure the cone into 4ths and draw an arch 1/4th of the way up. This is where the ribs arch up to in the back. 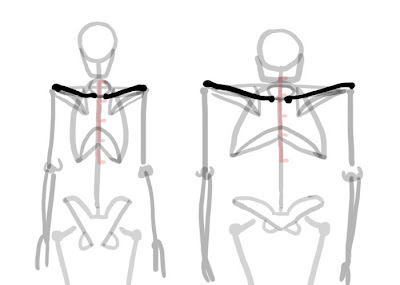 This is a very important point for drawing muscles in the back. Now draw an arch at about 1/3rd the way up (between a half and a quarter) and draw a hole going from the top of the cone to about 1/4th of the way down. This is the ribcage from the front. From the bottom of the hole to the top of the arch is the sternum. 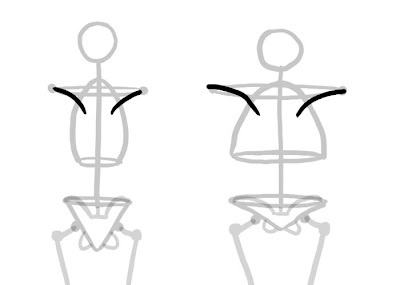 Draw two slightly bowed lines from the top of the sternum (bottom of the neck hole) to on top of the shoulder joints- that's where the collar bones go. 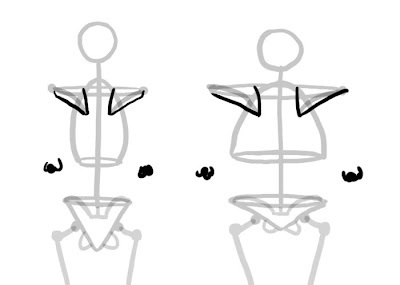 They actually connect at the top of the ribcage, so it's important to get that point right, especially when you want to draw the pectoral muscles and the front of the deltoid, both of which connect to them. You now have all the important structure needed to hang all the muscles of the front and back torso, neck, arms and thighs. Next week, part one of New Hotness muscles. Thanks, I'm really enjoying these lessons! I can't wait to see the muscles one, because that's where I've always struggled. And fat! "I've always been a little baffled my the disconnect from my ability to observe the figure and my inability to generate it from whole cloth in my head."THIS. I completely concur. This post--and all the New Hotness insights--are some of the most invaluable and helpful things I've found on the internet, ever (I've been struggling with the if I'm so great at figure study, why can't I create figures from my imagination dilemma for YEARS now). Loving your eye-opening posts and looking forward to more! Yes, this is so great, keep 'em coming!! Love this. Thank-you so much! I am finding these very helpful and useful. This will greatly improve my drawings!